I started this little sweater before Greg was born, and finished it in the weeks following his birth. It’s not for him, but for another little dude slated to make his appearance in mid-August. 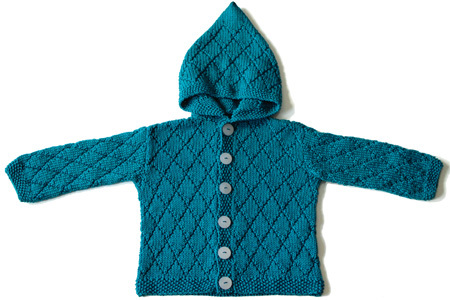 Pattern: Jasper Diamond Hoodie from Kristen Rengren’s Vintage Baby Knits (my review/preview here). I’ve lost count of the number of projects I’ve knit from this book; this is certainly not the first or even third or fifth. It continues to be my “go to” book for both creative patterns and sizing information, which is in the appendices. I followed the pattern exactly, down to binding off the shoulders and then seaming them together (I would typically work short rows and do a three-needle bind-off instead). With a newborn in the house, I can’t be bothered to think more than I have to. The only thing I did differently was to work the button bands after the body of the sweater was completed instead of simultaneously. That’s because when I started this project (pre-baby), I had high hopes of figuring out how to install snaps; even bought a bunch of supplies from joann.com for the purpose. The bands for the snaps were going to wait until I was done with the sweater: I didn’t want to commit to any specific band pattern until I saw how the whole sweater came together. Needless to say, the box from joann.com is still sitting unopened under my desk. I defaulted to the tried and true button band with button holes, which I can knit in my sleep. 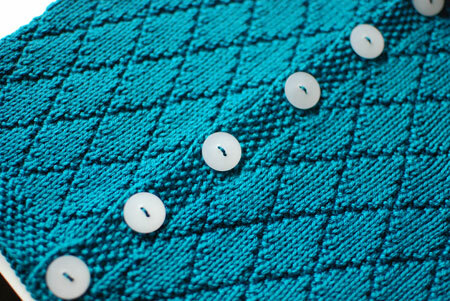 I originally wanted light yellow buttons for this sweater, but at the end decided that these cool white ones looked better against the teal fabric. Yarn: Cascade Yarns Ultra Pima 100% cotton, #3734, about 2.5 skeins. I enjoyed working with this yarn, and it’s machine-washable and dryable to boot! It did not bleed, fade, or fuzz up after washing, so that’s great. I am extremely saddened that I could not capture its true color, however :(. It’s a little bit more accurate in this post, though it’s even more saturated and vibrant in real life! Needles, gauge, finished size: I used US 4 needles and followed the directions for the second smallest size. My gauge was exactly the same as in the pattern, 24 stitches and 32 rows per 4″ in Diamond Pattern. The finished dimensions of the sweater were closer to the smallest size, however (probably because I didn’t stretch it much during blocking): 21″ chest circumference 7.5″ sleeve length to underarm, 10.75″ shoulder to hem. I think this is in the 6-12 months range, depending on the baby and how many layers he’s wearing underneath the sweater. Another lovely little knit from this book! I am never disappointed with the designs or the quality of the written patterns ;). Too cute. I need to check this book out for more baby gift ideas. I really love diamonds on boys. I saw a fantastic raglan cardigan recently in DK I think with large diamond lace pattern on the pattern in line with the raglan increases. I wouldn’t have though to use lace like that on a boy but it didn’t look girly at all. Congratulations on your new baby boy and on the new pretty little sweater. I will have to check out this book. I am attracted by the sizing information. We usually have a baby around the house (baby #7 is 14 months old) but I keep forgetting to take the measurements from them as they grow. Just call it Mommysitis. I love this pattern! I knit one for my son too. Excellent button choice. Stunned that you might take time to knit rather than sleep at this ‘new baby time’. You never cease to amaze me! Good on you. i love your hoodie!! i made one for my niece and I just LOVE this pattern!! gorgeous color. I also love this book, and have been wanting to make this sweater for awhile, but haven’t had quite the right yarn around yet…I’ll have to see what I can do about that. I love the ultra pima almost as much as I love the 220 Sport. It is great color, strong workhorse yarn without breaking the budget. Your sweater is super yumy and I love how baby knits take hardly any yarn at all! This came out so cute! I love the pattern. I think it might make a good “big guy” sweater too! Ficou muito fofo! A cor é linda! Really cute! The pattern is really standing out in that color! Darling! I love the diamond pattern. Just darling! I love the diamond pattern. Such a great color and I love the pattern. The color is really, really nice. It’s like a teal bluish color. Really nice. Hi -I’m a friend of Diana Troldahl, and out of curiosity, clicked on her Grumperina link … so here I am to say that your baby is adorable! I’m an occasional old grump myself, so my curiosity was aroused. With the accent on ‘old’, as in nine squared. So please do have a look at my blog, if it pleases you. I saw the sweater and immediately bought the book! We’re waiting for 2 grands to be born in the next month and this book is a welcome addition to my collection! Congrats on your little guy, he’s adorable!